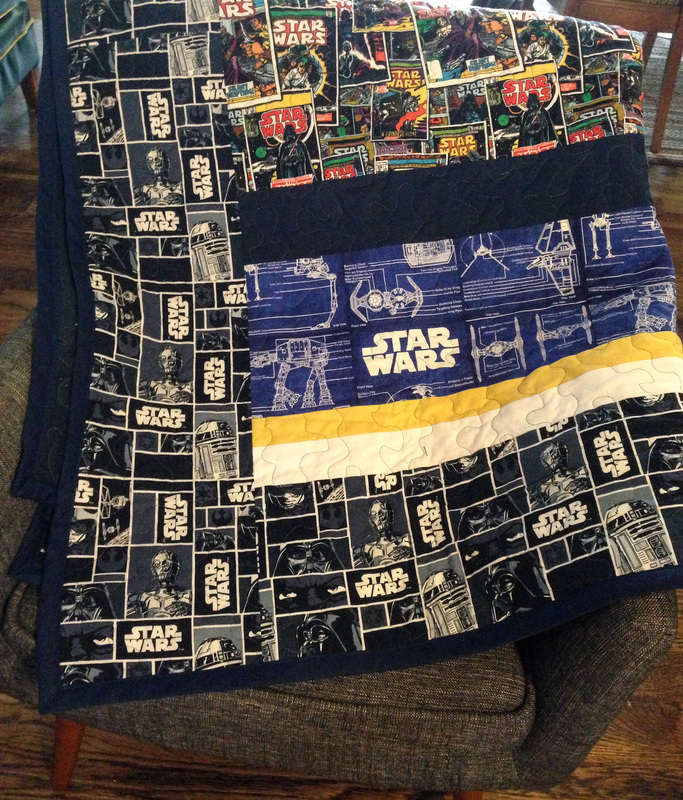 My younger brother is a huge Star Wars fan, and for his 18th birthday I thought a special Star Wars quilt was in order. I searched Pinterest for quilt ideas (you can see my quilt board here) and never really found exactly what I was looking for; so I decided to head to my local Joann Fabric, check out their selection of prints, and go from there. 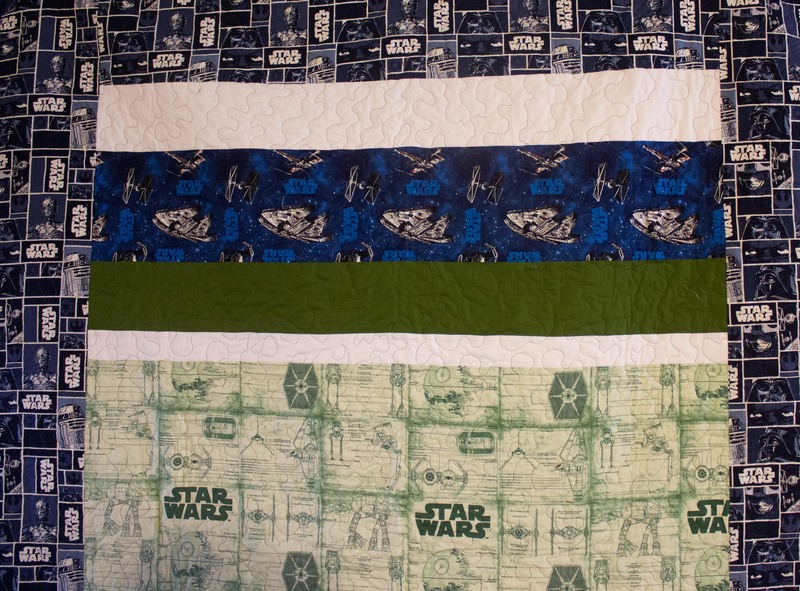 Based on what I found at the store, I decided to do a strip quilt with coordinating solids interspersed between the Star Wars panels. Once I finished the strip quilt section, I realized the quilt was going to be too narrow (no surprise I erred in my math calculations…math and me, we’re not good friends) and that’s when my husband gave me the idea to add the side sections to make a border around the quilt. The quilt finished up around 60″x80″ -a nice throw size blanket. Of course, I can’t just complete a project and give it to the person on time. No that would be too simple and planning way too far in advance. I was actually proud of myself that I was doing such a great job on finishing a project on time, when a little over halfway through the quilting, I ran out of thread- the afternoon of the party. Oops. My bad. I ended up finishing the quilt right before Christmas. Two months late but better late than never, right? 😉 Considering my last quilt gift was finished on the one year anniversary of the occasion, I’d say I’m doing much better these days. LOL. I used Kona Navy for the backing with the addition of one of the leftover border stripes and bound the quilt in a navy blue store-bought binding (I know, I know, for shame). The quilting is my current go-to method- stippling. I promise I’ll try another method soon! All in all I am really happy with how this turned out and hope my brother is happy with his personalized quilt. 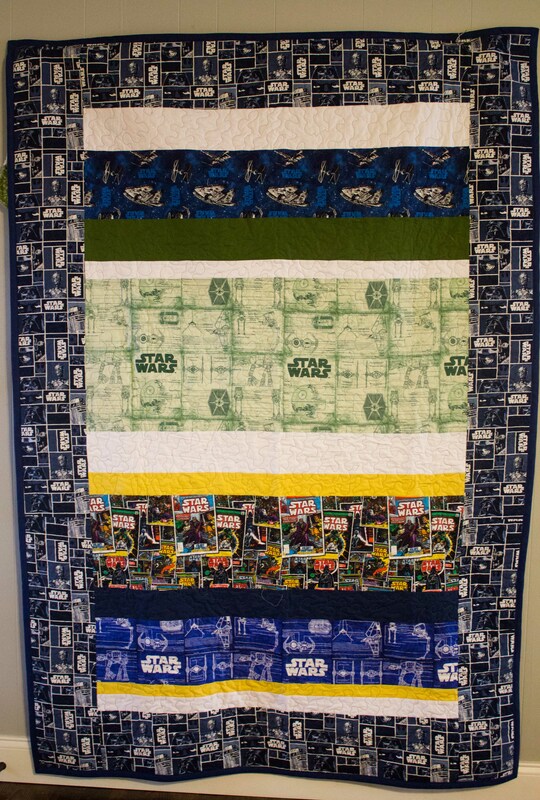 This entry was posted in Gifts, Quilts and tagged Joann Fabric, star wars, Star Wars fan, star wars quilt, strip quilt by oliver's fancy. Bookmark the permalink. Such a cute quilt, your brother is very lucky!